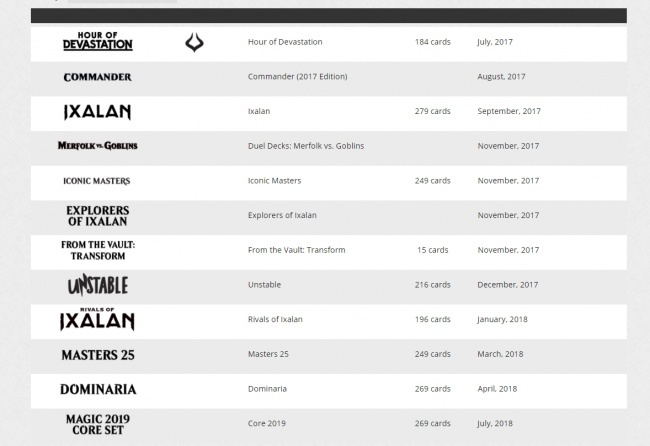 Wizards of the Coast has announced upcoming releases for its popular Magic: The Gathering collectible card game for the next year, including the Ixalan set, Dominaria, a 25th Anniversary-edition Masters set, and the return of Core sets. It was previously announced that the new expansion block in the fall would be Ixalan, with the first set releasing on September 29 (see “'Magic: The Gathering' Adds 'Ixalan,' 'Iconic Masters,' 'Commander 2017'”). 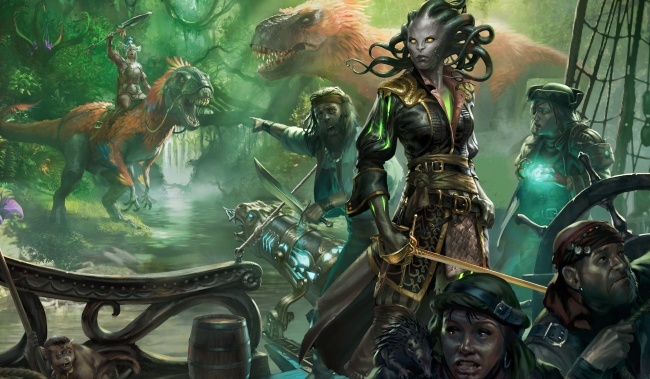 The 279-card set will take players into the untamed jungles of Ixalan, and its hidden city of gold, Orazca, where they will ride dinosaurs, sail the seas, and seek out the plane’s greatest fortune in the company of the Pirate Vraska. Prerelease Weekend will take place September 23 -24, Draft Weekend will be September 30 - October 1, and Game Day Weekend will be November 11 – 12. Ixalan will be available in Planeswalker Decks, Deck Builder’s Toolkit, Booster Packs, a Bundle, and Prerelease Packs. The second set for Ixalan will be Rivals of Ixalan, releasing January 19, 2018. The release will include Planeswalker Decks, Booster Packs, a Bundle, and Prerelease Packs. The next set will see a return to Dominaria, the first plane, and Magic creator Richard Garfield is on the design team. Dominaria releases April 27, 2018. Prerelease Weekend will be April 21 -22, Draft Weekend will be April 28 -29, and Game Day Weekend is June 23 -24. Dominaria will be available in Planeswalker Decks, Booster Packs, a Bundle, and Prerelease Packs. WOTC will celebrate Magic’s 25th Anniversary with a new Masters 25 set on March 16, 2018. The release will contain 249 cards from across Magic’s entire history, and will provide an epic drafting experience. MSRP is $9.99. The new core set, Core 2019, will release on July 20, 2018. The 269-card set is aimed at new players, though WOTC promised some useful cards for experienced players (see “'Magic: The Gathering' Evolves Once Again”). Core 2019 will be available in Planeswalker Decks, Booster Packs, a Bundle, and Prerelease Packs. There were several other products announced. Duel Decks: Merfolk vs Goblins will release on November 10. Two of the game’s most recognizable tribes will go head-to-head with these 60-card decks. MSRP is $19.99. The Magic: The Gathering Gift Pack will release on October 20. It includes 5 premium basic lands by artist Mark Poole ("Shooting Star Lands"), 2 premium creature cards (Metalwork Colossus and Kari Zev, Skyship Raider), 3 booster packs (XLN, HOU, AKH), spindown life counter, and Exclusive mini-poster (Featuring art from Hour of Devastation). MSRP is $19.99. From the Vault: Transform will include 15 double-faced transformation cards. It releases on November 24, and has an MSRP of $34.99. Explorers of Ixalan is a multiplayer Magic set where players search for the lost city of Ixalan. It will include four 60-card decks. Release is planned for November 24. MSRP is $64.99. The strange world of silver-boarded, non-tournament-legal “un-set” cards will return in Unstable on December 8. Unstable explores different areas of design for Magic by bending the rules of the game in fun and unusual ways. The silver-bordered cards can do things regular cards can’t. They are best used in limited formats like Sealed Deck or Booster Draft. 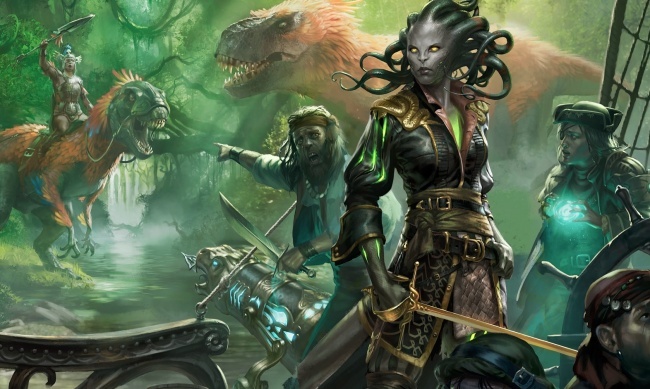 On January 2, 2018 The Art of Magic: The Gathering – Ixalan will release. Produced by VIZ Media, this will be the fifth book in the ongoing series (see “'The Art of Magic: The Gathering - Amonkhet'”). Wizards of the Coast promised more Magic reveals at HASCON, Hasbro’s new in-house convention in September (see “Stan Lee to Appear at First HASCON”).